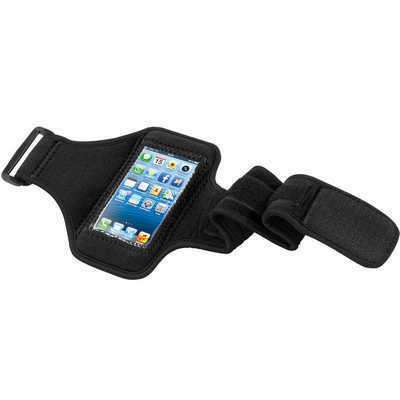 Description: This adjustable arm strap for iPhone5 has a velcro closure and PVC cover to protect and operate your iPhone. It has an earbud cord hole on the bottom and is made from Neoprene. Features: Packaging: Polybag. Colour: Black Material: 600D Polyester Product Size: Open: 485mm x 150mm. Freight details : 200 per carton, 10kgs, 58 x 35 x 32cms; Decoration Type(s): Colour Print. Decoration Area: Screen/Transfer: 15mm(w) x 40mm(h). Price includes : 1 Colour Print. Setup is included.